This gorgeous little frock is called ‘Hero’ and is made from a divine 100% silk damask. The rouleau straps are tied into darling little bows at the back and a brooch trims the belt. I love the way this dress is so different viewed from the front and the back. On the left is ‘Gem’ a flared corded lace gown with bands of satin around the hem edges. Beneath the flared lace gown is a slender silk duchesse satin dress. On the right is ‘Sofia’ made from the gorgeous silk damask. The ruching over the bodice of the gown is a perfect way to show off a neat waistline. There is a beautiful delicate diamante button at the centre of the handmade silk flower trimming the bodice. On the left is ‘Vivianna’ an entirely elegant gown made using a luxurious 100% silk light weight zibeline. Corded lace gives gently covers your shoulders. There is a border of the same corded lace around the hem of the skirt. 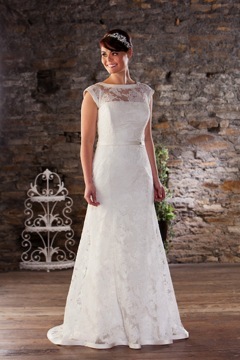 On the right ‘Reggie’ is a perfect gown for an elegant Autumn or Winter wedding. The elegant three quarter length sleeves will keep you safe from the chill and the lovely deep ‘v’ of the back neckline will ensure you won’t feel too warm indoors. We haven’t entirely finalised the details for Saturday 17th May but we do know there will be some bubbly! Call us on 029 2062 4477 to arrange your appointment.